ACS® Home & Hearth Cleaner is an industrial strength citrus cleaner. It is a high alkalinity citrus detergent that effectively cuts through smoke and creosote. Home & Hearth Cleaner is part of SaverSystems’ brick cleaner products that removes smoke and creosote stains from fireplace glass, hearths, stoves, brick, stone and more. ACS® Home & Hearth Cleaner combines the natural cleaning power of citrus with strong cleaning agents to tackle most tough household cleaning jobs. 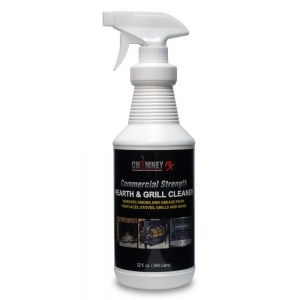 It is also a great outdoor grill cleaner as well as a cleaner for clothing and equipment that may have smoke and soot on them. ACS® Home & Hearth Cleaner also cleans walls, woodwork, kitchen surfaces and flooring, and leaves no streaks or film on surfaces. It provides a quick, easy way to clean anytime or anywhere, while leaving a long lasting scent of fresh oranges. ACS® Home & Hearth Cleaner is available in 32 oz. plastic spray bottles.